Michelle L. Tilghman, D.V.M., C.C.R.P., C.V.A. Dr. Michelle Tilghman is a leading authority and much-sought practitioner of integrative veterinary medicine, which harnesses both the fundamental strengths of Western medicine and the proven practices of Eastern medicine, developed and honed over the course of more than three thousand years. A graduate of the University of Georgia College of Veterinary medicine, she has been practicing veterinary medicine since 1982. She is the owner and chief practitioner of Loving Touch Animal Center, which focuses on integrative medicine, blending Eastern and Western medicine as well as physical therapy for complete patient care. Over the course of her career, Dr. Michelle has received national and international acclaim. In 2017, she received the Lifetime Achievement Award from the American Academy of Veterinary Medicine. She gained her certification as a veterinary acupuncturist from the International Veterinary Acupuncture Society (IVAS) in 1984. She is a member of American Veterinary Medical Association (AVMA), International Veterinary Acupuncture Society (IVAS), American Acupuncture Veterinary Academy (AAVA) and the American Holistic Veterinary Medical Society (AHVMA). She has been the president of the AHVMA, has served on the board for the AAVA, and was a former Chair of International Education for IVAS. She is currently on the conference committee for the AHVMA. 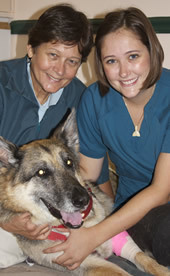 In 2004, she received certification as a canine rehabilitation practitioner (CCRP) at the University of Tennessee. As an international educator, she has taught in Brazil, Belgium, and Germany (to name a few), where she instructed veterinary students and doctors in over 40 sessions on the topics of acupuncture, rehabilitation, and complementary modalities. She was also an adjunct professor at Virginia-Maryland Regional College of Veterinary Medicine. In 2010, she was invited to be a guest lecturer at Grand Rounds at Purdue University’s School of Veterinary Medicine. She is a contributing author of the second edition of Veterinary Acupuncture: Ancient Art to Modern Medicine (Schoen Am, St Louis, 2001, Mosby). She has written articles for Animal Wellness Magazine and Integrative Veterinary Medicine. Dr. Michelle has lectured on acupuncture, Chinese herbs, tongue and pulse, geriatric medicine and physical therapy at IVAS, AHVMA, AVMA and many state veterinary meetings in the United States. 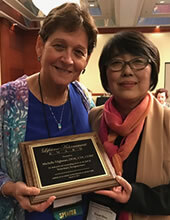 She has taught acupuncture for IVAS from 1999 to 2012. In 2012, she was invited to present at the Traditional Chinese Veterinarian Conference in Su-zhou, China. Dr. Michelle is the mother of daughters Naia and Rosemary. Rosemary received her DVM from Ross Veterinary School in 2017 and currently practices at Loving Touch Animal Center. Her hobbies include organic gardening and underwater photography. She is a research diver with Mote Marine Aquarium in Sarasota, FL.